This article is about the physical universe. "Natural" and "Natural World" redirect here. Nature, broadly defined, refers to the physical (natural, material) world at all levels (subatomic to cosmic), especially when regarded as distinct from human beings and those things generated or substantially altered by humans. The term encompasses the universe of living organisms and their components (cells, plants, animals, fungi, taxa, etc. ), inanimate entities (rocks, abiotic natural resources, etc. ), ecosystems (aquatic, terrestrial, wetland, etc. ), landscapes and geological formations (mountains, rivers, beaches, waterfalls, etc. ), phenomena (weather, tornadoes, hurricanes, sunsets, etc. 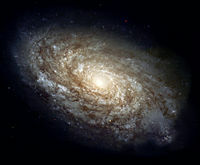 ), forces and processes (laws of nature), and even the cosmos itself. Some views include humans (consciousness, activities, etc), but independent of their creations. While the term nature has multiple dictionary meanings, including the essential character or fundamental quality of a person or thing, it is in the sense of the natural world, physical universe, or material world surrounding human beings that the term will be used in this article. Nature not only provides the necessary environment for human existence and other valued physical components and functions; it also offers aesthetic and internal attributes. Whether experienced directly, such as smelling a flower, viewing a sunset, or listening to the ocean waves, or experienced through paintings, sound recordings, and other artistic media, nature touches the senses of human beings and inspires their inner essence. Despite the extraordinary diversity in nature, there is a sense of remarkable unity and harmony at each level. The rotation of the planets around the sun, the sunlight captured by plants, the exchange of carbon dioxide and oxygen between plants and animals, the food chain, the harmony of organ systems, the intricacy of mitosis and meiosis at the cellular level, and the universality of nucleic acids for carrying genetic information are but some examples. So stunning is the harmony evident among organisms, and between organisms and the environment, that some have proposed a theory that the entire Earth acts as if one, giant, functioning organism (the Gaia hypothesis). One underlying explanation for such unity is the concept of bi-level functionality. Both secular-based ideologies that have been emerging in the last several decades, and world religions in existence for millennium, have dealt with human ethics towards nature. For example, an ecological concept that originated with the Iroquois (native North Americans), known as seven-generation sustainability, holds that is is appropriate to think seven generations ahead in making decisions, recognizing the impact on the children of the future. The word nature is derived from the Latin word natura, meaning "essential quality," "origin," "innate disposition", and in ancient times, literally meant "birth," coming from nasci, "to be born." Natura was a Latin translation of the Greek word physis (φύσις), which originally related to the intrinsic characteristics that plants, animals, and other features of the world develop of their own accord. The concept of nature as a whole, the physical universe, is one of several expansions of the original notion; it began with certain core applications of the word φύσις by pre-Socratic philosophers, and has steadily gained currency ever since. This usage was confirmed during the advent of modern scientific method in the last several centuries. Within the various uses of the word today, "nature" may refer to the general realm of various types of living plants and animals, to inanimate objects, to assemblages of plants, animals, and other living organisms together with their abiotic environment (ecosystems, biomes), and in some cases to the processes associated with inanimate objects–the way that particular types of things exist and change of their own accord, such as the weather and geology of the Earth. It also may refer to the matter and energy of which all these things are composed. It is often taken to mean the "natural environment" or wilderness–wild animals, rocks, forest, beaches, and in general those things that have not been substantially altered by human intervention, or which persist despite human intervention. For, example, manufactured objects and human interaction generally are not considered part of nature, unless qualified as, for example, "human nature" or "the whole of nature." This more traditional concept of natural things, which can still be found today, implies a distinction between the natural and the artificial, with the artificial being understood as that which has been brought into being by a human consciousness or a human mind. Depending on the particular context, the term "natural" might also be distinguished from the unnatural, the supernatural, and the artifactual. References to nature often highlight abiotic units (such as rocks, soil, lakes, oceans), landscapes and geological formations (such as volcanoes, mountains, beaches), phenomena (such as weather, hurricanes, tornadoes, sunsets), and forces and processes (such as the laws of nature), as well as the underlying matter and energy. Some fields of science see nature as matter in motion, obeying certain laws of nature, which science seeks to understand. For this reason the most fundamental science is generally understood to be "physics"—the name for which is still recognizable as meaning that it is the study of nature. Matter is commonly defined as the substance of which physical objects are composed. It constitutes the observable universe. The visible components of the universe are now believed to compose only 4.6 percent of the total mass. The remainder is believed to consist of 23 percent cold dark matter and 72 percent dark energy. The exact nature of these components is still unknown and is currently under intensive investigation by physicists. The behavior of matter and energy throughout the observable universe appears to follow well-defined physical laws. These laws have been employed to produce cosmological models that explain the structure and the evolution of the universe we can observe. 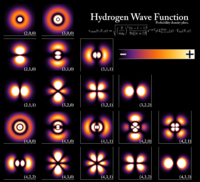 The mathematical expressions of the laws of physics employ a set of twenty physical constants that appear to be static across the observable universe. The values of these constants have been carefully measured, but the reason for their specific values remains a mystery. The atmosphere of the Earth serves as a key factor in sustaining the planetary ecosystem. The thin layer of gases that envelops the Earth is held in place by the planet's gravity. Dry air consists of 78% nitrogen, 21% oxygen, 1% argon and other inert gases, carbon dioxide, and so forth; but air also contains a variable amount of water vapor. The atmospheric pressure declines steadily with altitude, and has a scale height of about 8 kilometers at the Earth's surface: the height at which the atmospheric pressure has declined by a factor of e (a mathematical constant equal to 2.71...). 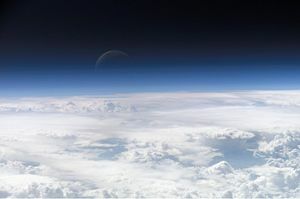 The ozone layer of the Earth's atmosphere plays an important role in depleting the amount of ultraviolet (UV) radiation that reaches the surface. As DNA is readily damaged by UV light, this serves to protect life at the surface. The atmosphere also retains heat during the night, thereby reducing the daily temperature extremes. Terrestrial weather occurs almost exclusively in the lower part of the atmosphere, and serves as a convective system for redistributing heat. Ocean currents are another important factor in determining climate, particularly the major underwater thermohaline circulation which distributes heat energy from the equatorial oceans to the polar regions. These currents help to moderate the differences in temperature between winter and summer in the temperate zones. Also, without the redistributions of heat energy by the ocean currents and atmosphere, the tropics would be much hotter, and the polar regions much colder. Weather can have both beneficial and harmful effects. 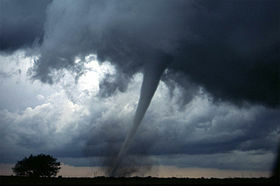 Extremes in weather, such as tornadoes or hurricanes and cyclones, can expend large amounts of energy along their paths, and produce devastation. Surface vegetation has evolved a dependence on the seasonal variation of the weather, and sudden changes lasting only a few years can have a dramatic effect, both on the vegetation and on the animals which depend on its growth for their food. A tornado in central Oklahoma. The planetary climate is a measure of the long-term trends in the weather. Various factors are known to influence the climate, including ocean currents, surface albedo, greenhouse gases, variations in the solar luminosity, and changes to the planet's orbit. Based on historical records, the Earth is known to have undergone drastic climate changes in the past, including ice ages. The climate of a region depends on a number of factors, especially latitude. A latitudinal band of the surface with similar climatic attributes forms a climate region. There are a number of such regions, ranging from the tropical climate at the equator to the polar climate in the northern and southern extremes. Weather is also influenced by the seasons, which result from the Earth's axis being tilted relative to its orbital plane. Thus, at any given time during the summer or winter, one part of the planet is more directly exposed to the rays of the sun. This exposure alternates as the Earth revolves in its orbit. At any given time, regardless of season, the northern and southern hemispheres experience opposite seasons. Weather is a chaotic system that is readily modified by small changes to the environment, so accurate weather forecasting is currently limited to only a few days. The Iguazu waterfalls in the border between Brazil and Argentina. Water is a stable chemical substance that is composed of one oxygen atom bound via single covalent bonds to two hydrogen atoms. It is the only common molecule on the Earth that exists at liquid at the temperatures prevailing on Earth, although the substance also has a solid state, ice, and a gaseous state, water vapor or steam. About three-quarters of the earth—70.9% of the Earth's surface—is covered by liquid water. In addition, life is tied to water, with a substantial part of organisms' bodies (about two-thirds) composed of water and a water-rich environment, either internal or external, required for reproduction and growth. A property of water that makes it so invaluable to life is the ability to form hydrogen bonds. This in turn, allows water molecules to be cohesive (attracted to one another), adhesive (attracted to other polar molecules), have a high specific heat (maintain temperature longer and heat up slowly), and have a high heat of vaporization (evaporation allows cooling). The fact that solid water (ice) is less dense than liquid water—hydrogen ions from a crystal-like lattice of hydrogen bonds, yielding less dense ice—means bodies of water freeze from the top down, not bottom up, allowing them to remain liquid in parts and sustain life. Water's solvent properties with respect to ions and polar molecules allows it to move these substances, and its lack of solubility for nonpolar molecules helps to organize these molecules, impacting structures of nucleic acids, proteins, and biological membranes. On Earth, water is found mostly in oceans and other large water bodies, with 1.6% of water below ground in aquifers and 0.001% in the air as vapor, clouds (formed of solid and liquid water particles suspended in air), and precipitation. Oceans hold 97% of surface water, glaciers and polar ice caps 2.4%, and other land surface water such as rivers, lakes, and ponds 0.6%. Additionally, a minute amount of the Earth's water is contained within biological bodies and manufactured products. 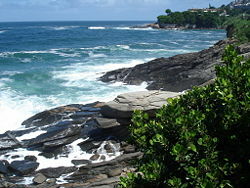 A view of the Atlantic ocean from Leblon, Rio de Janeiro. An ocean is a major body of saline water, and a principal component of the hydrosphere. Over 70% of the Earth's surface (an area of some 361 million square kilometers) is covered by ocean, a continuous body of water that is customarily divided into several principal oceans and smaller seas. More than half of this area is over 3,000 meters (9,800 ft) deep. Average oceanic salinity is around 35 parts per thousand (ppt) (3.5%), and nearly all seawater has a salinity in the range of 30 to 38 ppt. Though generally recognized as several "separate" oceans, these waters comprise one global, interconnected body of salt water often referred to as the World Ocean or global ocean. This concept of a global ocean as a continuous body of water with relatively free interchange among its parts is of fundamental importance to oceanography. The major oceanic divisions are defined in part by the continents, various archipelagos, and other criteria: these divisions are (in descending order of size) the Pacific Ocean, the Atlantic Ocean, the Indian Ocean, the Southern Ocean and the Arctic Ocean. Smaller regions of the oceans are called seas, gulfs, bays and other names. There are also salt lakes, which are smaller bodies of landlocked saltwater that are not interconnected with the World Ocean. Two notable examples of salt lakes are the Aral Sea and the Great Salt Lake. A lake (from Latin lacus) is a terrain feature (or physical feature), a body of liquid on the surface of a world that is localized to the bottom of basin (another type of landform or terrain feature; that is, it is not global) and moves slowly if it moves at all. On Earth, a body of water is considered a lake when it is inland, not part of the ocean, is larger and deeper than a pond, and is fed by a river. The only world other than Earth known to harbor lake-like bodies is Titan, Saturn's largest moon, which has lakes of ethane, most likely mixed with methane. It is not known if Titan's lakes are fed by rivers, though Titan's surface is carved by numerous river beds. 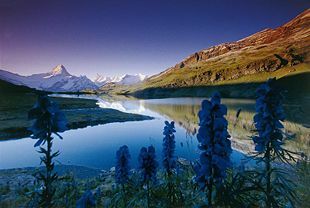 Natural lakes on Earth are generally found in mountainous areas, rift zones, and areas with ongoing or recent glaciation. Other lakes are found in endorheic basins or along the courses of mature rivers. 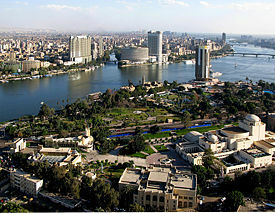 In some parts of the world, there are many lakes because of chaotic drainage patterns left over from the last Ice Age. All lakes are temporary over geologic time scales, as they will slowly fill in with sediments or spill out of the basin containing them. 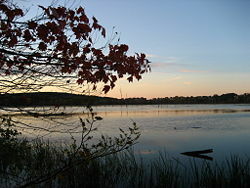 The Westborough Reservoir (Mill Pond) in Westborough, Massachusetts. A pond is a body of standing water, either natural or man-made, that is usually smaller than a lake. 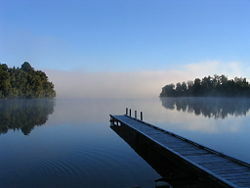 The technical distinction between a pond and a lake has not been universally standardized, although individual organizations have established distinctions based on such factors as size (with upper limits for pond size set a 2, 5 and 8 hectares, for example), whether the light penetrates to the bottom, whether there is wave action on the shoreline, whether rooted plant life can grow throughout, and so forth. A wide variety of man-made bodies of water are classified as ponds, including water gardens designed for aesthetic ornamentation, fish ponds designed for commercial fish breeding, and solar ponds designed to store thermal energy. Ponds and lakes are distinguished from streams via current speed. While currents in streams are easily observed, ponds and lakes possess thermally driven microcurrents and moderate wind driven currents. 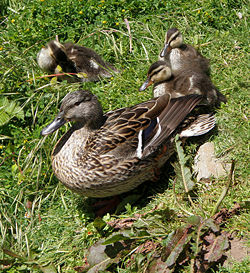 These features distinguish a pond from many other aquatic terrain features, such as stream pools and tide pools. A river is a natural waterway that conveys water from higher ground to lower levels, flowing toward an ocean, a lake, a sea or another river. In a few cases, a river simply flows into the ground or dries up completely before reaching another body of water. A river is part of the hydrological cycle. Water within a river is generally collected from precipitation through surface runoff, groundwater recharge, springs, and the release of stored water in natural ice and snowpacks (i.e., from glaciers). Likewise, the term stream is used for a flowing body of water with a current, confined within a bed and stream banks. While commonly the term stream is used for smaller waterways than rivers, in the scientific community a stream is an umbrella term for all types of flowing natural waters, regardless of size. For example, in the United States, the US Board on Geographic Names classifies all “linear flowing bodies of water” as streams, a designation that includes what some may call rivers. Others commonly consider a stream as a watercourse less than the size of a river, for example, less than 60 feet (18 meters) wide. Not only is the terminology regarding rivers and streams imprecise, but rivers and streams may be called by numerous other names, such as creek, brook, rivulet, and rill. There are at least 121 different generic names used in the United States alone for stream (or river). Many names for small rivers are specific to geographic location; one example is Burn in Scotland and North-east England. 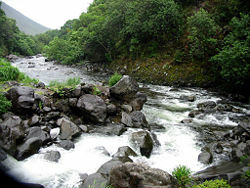 A rocky stream in Hawaii. Rivers and streams are important as conduits in the water cycle, instruments in groundwater recharge, and they serve as corridors for fish and wildlife migration. The biological habitat in the immediate vicinity of a stream is called a riparian zone. Given the status of the ongoing Holocene extinction, streams play an important corridor role in connecting fragmented habitats and thus in conserving biodiversity. The study of streams and waterways in general is known as surface hydrology and is a core element of environmental geography. Living organisms (plants, animals, fungi, etc. ), both individual and collectively (taxa) are identified as "nature," as well as their components (cells, DNA, mitochondria, etc. ), activities (decomposition, photosynthesis, etc. ), and relationships (food chains, predation, symbiosis, etc.). Nature also is used to include organisms that are no longer in existence (dinosaurs, pterosaurs, woolly mammoths, etc.) or traces of their existence (fossils). A difficult term to define, "life" can be considered the characteristic state of living organisms and individual cells, or that quality or property that distinguishes living organisms from dead organisms and inanimate objects. Although there is no universal agreement on the definition of life, biological properties common to the known organisms found on Earth (plants, animals, fungi, protists, archaea, and bacteria) are that they are carbon-and-water-based, are cellular with complex organization, use energy and undergo metabolism, possess a capacity to grow, maintain homeostasis, respond to stimuli, reproduce, and have various adaptations to the environment. An entity with these properties is generally considered life. However, not every definition of life considers all of these properties to be essential. Beyond the biological manifestations of matter, some philosophical perspectives, notably the Aristotelian theory of the soul and modern vitalism, add that living organisms possess an inner aspect or character that confers the quality of life (Philosophical characteristics of life). They do not agree with a modern biological orientation that explains the phenomena of life only in terms of external principles of chemistry and physics. The biosphere is historically and most commonly defined as that part of the Earth in which living organisms exist. That is, it is the part of Earth's outer shell—including land, surface rocks, water, air and the atmosphere—within which life occurs, and which biotic processes in turn alter or transform. However, another perspective considers the biosphere to be simply "life on earth"; in other words, the total of all living things on earth Yet, another definition of biosphere includes both the living organisms and their environment. From the broadest geophysiological point of view, the biosphere is the global ecological system integrating all living beings and their relationships, including their interaction with the elements of the lithosphere (rocks), hydrosphere (water), and atmosphere (air). Currently the entire Earth contains over 75 billion tons (150 trillion pounds or about 6.8 x 1013 kilograms) of biomass (life), which lives within various environments within the biosphere. The portion of total biomass accounted for by humans is about one-half of one percent. Over nine-tenths of the total biomass on Earth is plant life, on which animal life depends very heavily for its existence. More than 2 million species of plant and animal life have been identified to date, and estimates of the actual number of existing species range from several million to over 100 million. The number of individual species of life is constantly in some degree of flux, with new species appearing and others ceasing to exist on a continual basis. The total number of species is considered to be presently in rapid decline. 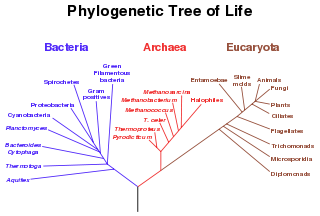 A phylogenetic tree based on rRNA data, showing the separation of bacteria, archaea, and eukaryote. Living organisms are classified in various ways, with the three-domain system of Carl Woese (with top-level groupings of Archaea, Eubacteria, and Eukaryota) being popular, as well as groupings into five or six kingdoms (Archaebacteria, Monera, Protista, Fungi, Plantae, and Animalia). 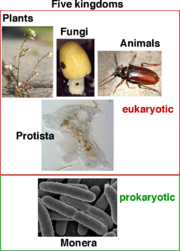 More basic, living organisms are divided into the two groups of prokaryotes and eukaryotes. 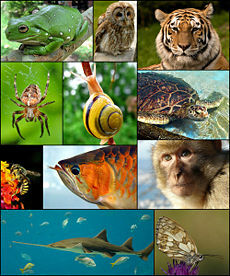 There are many animal species on the planet. Plants are multicellular, mostly photosynthetic eukaryotes that also have cell walls composed of cellulose, do not have a central nervous system, are generally non-motile, and reproduce sexually, often by alternation of phases of a single generation (Alternation of generations). This kingdom includes familiar organisms such as trees, shrubs, herbs, and ferns. 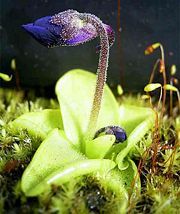 Over 350,000 species of plants have been estimated to exist. Animals are generally considered to be multicellular organisms that are capable of locomotion in response to their environment (motile), are required to ingest or eat and swallow other organisms to gain proper nutrition (heterotropic), contain within each cell genetic material organized as two sets of chromosomes within a membrane-bound nucleus (eukaryotic), develop through a blastula (hollow ball) stage, and integrate muscle tissue, nervous tissue, and collagen into their body. Fungi are eukaryotic organisms that digests their food externally and absorb the nutrient molecules into their cells. Fungi differ from bacteria in having a cell nucleus; from plants in not making their own food through photosynthesis; and from animals in not being mobile and in absorbing nutrition externally rather than internally. Fungi include mushrooms, yeasts, molds, mildews, and others. Protists are a heterogeneous group of living organisms, comprising those eukaryotes that are not animals, plants, or fungi. In systems of biological classification, they usually are treated as the Kingdom Protista or Protoctista. Protists are more complex than bacteria in that they have cell nuclei, but less complex than fungi, plants, and animals because they are mostly single-celled, or if multi-celled, they lack highly specialized tissues. The protists are a paraphyletic grade, rather than a natural (monophyletic) group, and do not have much in common besides a relatively simple organization. Some call it the "left-overs" from the other eukaryotic kingdoms. Archaea or Archaebacteria historically have been included in the Kingdom Monera with the bacteria and the blue-green algae (cyanobacteria or blue-green bacteria). Like bacteria, archaea or archaebacteria are single-celled organisms lacking nuclei and are therefore prokaryotes. However, the unique nature of the archaebacteria has led to classifications where they are not included with Monera. In the six kingdom system, the archaebacteria are separated into their own kingdom, Archaebacteria or Archaea. In the three-domain system of biological classification, Archaea joins Eukaryota and Bacteria as the three domains, the top-level grouping of organisms. Among the many ways of classifying plants are by regional floras, which, depending on the purpose of study, can also include fossil flora, remnants of plant life from a previous era. 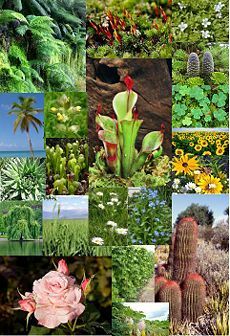 People in many regions and countries take great pride in their individual arrays of characteristic flora, which can vary widely across the globe due to differences in climate and terrain. Regional floras commonly are divided into categories such as native flora and agricultural and garden flora, the lastly mentioned of which are intentionally grown and cultivated. Some types of "native flora" actually have been introduced centuries ago by people migrating from one region or continent to another, and become an integral part of the native, or natural flora of the place to which they were introduced. This is an example of how human interaction with nature can blur the boundary of what is considered nature. Another category of plant has historically been carved out for weeds. Though the term has fallen into disfavor among botanists as a formal way to categorize "useless" plants, the informal use of the word "weeds" to describe those plants that are deemed worthy of elimination is illustrative of the general tendency of people and societies to seek to alter or shape the course of nature. Similarly, animals are often categorized in ways such as domestic, farm animals, wild animals, pests, etc. according to their relationship to human life. Ecosystems and biomes are commonly identified as nature. 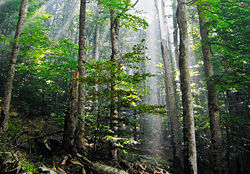 Considered by some to be the basic unit in ecology, an ecosystem can be defined as an ecological unit consisting of a biotic community (an assemblage of plant, animal, and other living organisms) together with its abiotic environment (such as soil, precipitation, sunlight, temperature, slope of the land, etc.). 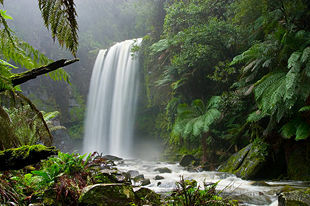 Ecosystems may be very large, such as a tropical rain forest, the Everglades, or the Pantanal, or very small, such as a test tube of phytoplankton or an aquarium tank with plants and fish. A river, a swamp, a meadow, and a cave are all examples of ecosystems. A biome often is referred to as an extensive ecosystem—a large geographic region of the earth's surface with distinctive plant and animal communities. A biome may also be considered a grouping of many ecosystems that share similar environmental features and communities (organisms living together in a certain area). Collectively, biomes comprise the biosphere. Loch Lomond in Scotland forms a relatively isolated ecosystem. The fish community of this lake has remained unchanged over a very long period of time. Ecosystems are composed of a variety of abiotic and biotic components that function in an interrelated way. The structure and composition is determined by various environmental factors that are interrelated. Variations of these factors will initiate dynamic modifications to the ecosystem. Some of the more important components are: soil, atmosphere, radiation from the sun, water, and living organisms. Central to the ecosystem concept is the idea that living organisms interact with every other element in their local environment. Eugene Odum, a founder of ecology, stated: "Any unit that includes all of the organisms (the "community") in a given area interacting with the physical environment so that a flow of energy leads to clearly defined trophic structure, biotic diversity, and material cycles (i.e. : exchange of materials between living and nonliving parts) within the system is an ecosystem." Within the ecosystem, species are connected and dependent upon one another in the food chain, and exchange energy and matter between themselves as well as with their environment..
Old growth European Beech forest in Biogradska Gora National Park, Montenegro. Wilderness is generally defined as an area that has not been significantly modified by human activity. The WILD Foundation goes into more detail, defining wilderness as: "The most intact, undisturbed wild natural areas left on our planet—those last truly wild places that humans do not control and have not developed with roads, pipelines or other industrial infrastructure." Wilderness areas can be found in preserves, estates, farms, conservation preserves, ranches, National Forests, National Parks and even in urban areas along rivers, gulches or otherwise undeveloped areas. Wilderness areas and protected parks are considered important for the survival of certain species, ecological studies, conservation, solitude, and recreation. Some nature writers believe wilderness areas are vital for the human spirit and creativity, and some ccologists consider wilderness areas to be an integral part of the planet's self-sustaining natural ecosystem (the biosphere). They may also preserve historic genetic traits and that they provide habitat for wild flora and fauna that may be difficult to recreate in zoos, arboretums or laboratories. 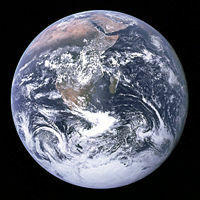 View of the Earth, taken in 1972 by the Apollo 17 astronaut crew. This image is the only photograph of its kind to date, showing a fully sunlit hemisphere of the Earth. Earth (or, "the earth") is the only planet presently known to support life, and its natural features are the subject of many fields of scientific research. Within the solar system, it is third nearest to the sun; it is the largest terrestrial planet and the fifth largest overall. Its most prominent climatic features are its two large polar regions, two relatively narrow temperate zones, and a wide equatorial tropical to subtropical region. Precipitation varies widely with location, from several meters of water per year to less than a millimeter. about 71 percent of the Earth's surface is covered by salt-water oceans. The remainder consists of continents and islands, with most of the inhabited land in the Northern Hemisphere. Earth has evolved through geological and biological processes that have left traces of the original conditions. 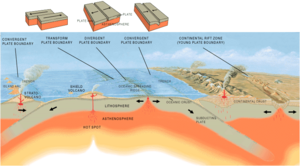 The outer surface is divided into several gradually migrating tectonic plates. The interior remains active, with a thick layer of molten mantle and an iron-filled core that generates a magnetic field. The atmospheric conditions have been significantly altered from the original conditions by the presence of life-forms, which create an ecological balance that stabilizes the surface conditions. Despite the wide regional variations in climate by latitude and other geographic factors, the long-term average global climate is quite stable during interglacial periods, and variations of a degree or two of average global temperature have historically had major effects on the ecological balance, and on the actual geography of the Earth. An animation of the Earth's hypothesized Pangaea separation. Plankton inhabit oceans, seas and lakes, and have existed on the Earth for at least 2 billion years. Earth is estimated to have formed 4.54 billion years ago from the solar nebula, along with the Sun and other planets. The moon formed roughly 20 million years later. Initially molten, the outer layer of the planet cooled, resulting in the solid crust. 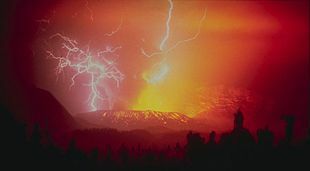 Outgassing and volcanic activity produced the primordial atmosphere. Condensing water vapor, most or all of which came from ice delivered by comets, produced the oceans and other water sources. Continents formed, then broke up and reformed as the surface of Earth reshaped over hundreds of millions of years, occasionally combining to make a supercontinent. Roughly 750 million years ago, the earliest known supercontinent Rodinia, began to break apart. The continents later recombined to form Pannotia which broke apart about 540 million years ago, then finally Pangaea, which broke apart about 180 million years ago. There is significant evidence that a severe glacial action during the Neoproterozoic era covered much of the planet in a sheet of ice. 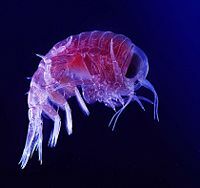 This hypothesis has been termed the "Snowball Earth", and it is of particular interest as it precedes the Cambrian explosion in which multicellular life forms began to proliferate about 530–540 million years ago. Since the Cambrian explosion there have been five distinctly identifiable mass extinctions. The last mass extinction occurred some 65 million years ago, when a meteorite collision might have triggered the extinction of the non-avian dinosaurs and other large reptiles, but spared small animals such as mammals, which then resembled shrews. Over the past 65 million years, mammalian life diversified. Several million years ago, a species of small African ape gained the ability to stand upright. The subsequent advent of human life, and the development of agriculture and further civilization allowed humans to affect the Earth more rapidly than any previous life form, affecting both the nature and quantity of other organisms as well as global climate. By comparison, the oxygen catastrophe, produced by the proliferation of algae during the Siderian period, required about 300 million years to culminate. The present era is classified as part of a mass extinction event, the Holocene extinction event, the fastest ever to have occurred. Outer space, also simply called space, refers to the relatively empty regions of the universe outside the atmospheres of celestial bodies. Outer space is used to distinguish it from airspace (and terrestrial locations). There is no discrete boundary between the Earth's atmosphere and space, as the atmosphere gradually attenuates with increasing altitude. Outer space within the solar system is called interplanetary space, which passes over into interstellar space at what is known as the heliopause. Outer space is certainly spacious, but it is far from empty. 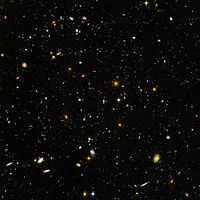 Outer space is sparsely filled with several dozen types of organic molecules discovered to date by microwave spectroscopy, blackbody radiation left over from the big bang and the origin of the universe, and cosmic rays, which include ionized atomic nuclei and various subatomic particles. There is also some gas, plasma and dust, and small meteors. Additionally, there are signs of human life in outer space today, such as material left over from previous manned and unmanned launches, which are a potential hazard to spacecraft. Some of this debris re-enters the atmosphere periodically. Although the planet Earth is currently the only known body within the solar system to support life, current evidence suggests that in the distant past the planet Mars possessed bodies of liquid water on the surface. For a brief period in Mars' history, it may have also been capable of forming life. At present though, most of the water remaining on Mars is frozen. Conditions on the other close terrestrial planets, Mercury and Venus, appear to be too harsh to support life as we know it. But it has been conjectured that Europa, the fourth-largest moon of Jupiter, may possess a sub-surface ocean of liquid water and could potentially host life. 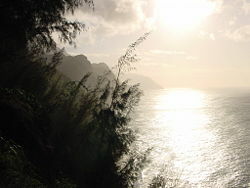 Despite their natural beauty, the secluded valleys along the Na Pali Coast in Hawaii are heavily modified by introduced invasive species such as She-oak. "Nature" is often regarded as distinct from human beings and their creations; commonly, it is depicted as something that surrounds human beings and with which human beings interact. Indeed, humans are remarkably unique from other living organisms. For example, despite the close physical similarity, the gap between humans and other great apes (and other animals in general) is qualitatively huge, in terms of cultural, psychological, and spiritual aspects. Humans have a complex language, use symbols in communication, write and read books, have set up diverse systems of governance, have remarkable self-awareness, conduct scientific experiments, practice religious traditions, have developed complex technologies, and so forth. As noted by eminent evolutionist Ernst Mayr, "Man is indeed unique, as different from all other animals, as has been traditionally claimed by theologians and philosophers,"
However, humans beings live in a biosphere that is all interrelated and is necessary for physical life. 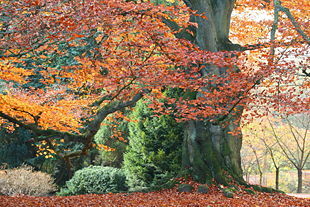 Nature also provides numerous non-essential but valued products and functions, such as aesthetic values. The interrelationship between humans and nature is particularly notable in that humans, although they comprise only a minuscule proportion of the total living biomass on Earth, have a disproportionately large effect on nature. Because of the extent of human influence, the boundaries between what humans regard as nature and "made environments" is not clear cut except at the extremes. Even at the extremes, the amount of natural environment that is free of discernible human influence is presently diminishing at an increasingly rapid pace. The development of technology by the human race has allowed the greater exploitation of natural resources and has helped to alleviate some of the risk from natural hazards. In spite of this progress, however, the fate of human civilization remains closely linked to changes in the environment. There exists a highly complex feedback loop between the use of advanced technology and changes to the environment that are only slowly becoming understood. Man-made threats to the Earth's natural environment include pollution, deforestation, draining of wetlands, and disasters such as oil spills. Humans have contributed to the extinction of many plants and animals. Humans employ nature for both leisure and economic activities. The acquisition of natural resources for industrial use remains the primary component of the world's economic system. Some activities, such as hunting and fishing, are used for both sustenance and leisure, often by different people. Agriculture was first adopted around the 9th millennium B.C.E. Ranging from food production to energy, nature influences economic wealth. While humans have created many detrimental impacts on their natural environment, nature also has been revered and appreciated in human cultures throughout recorded history. Both secular-based ideologies that have been emerging in the last several decades, and world religions in existence for millennium, have dealt with human ethics towards nature. Jainism, for example, is known for its view of ahisma, meaning nonviolence towards all living beings. Islam, Buddhism, and Hinduism all have sacred scripture addressing reverence for all life and the sanctity of nature. Shinto text admonishes humans to regard all things as their brothers and sisters. Confucianists note that their founder would not fish with a net, and Mencius admonished people to not use nets with too fine a mesh and to limit cutting of forests. In the Judeo-Christian tradition, humans are viewed as having a special covenant with God as stewards of nature. This is sometimes referred to as the "third blessing," the role of humankind to love and care for creation. An ecological concept that originated with the Iroquois (native North Americans), known as seven-generation sustainability, holds that is is appropriate to think seven generations ahead in making decisions, recognizing the impact on the children of the future. Given the unique human role, it is generally understood that it is essential that human beings, as the most powerful of all life forms and in many ways an encapsulation of the whole (a "microcosm of creation" according to a theological perspective), understand and care for the environment. Beauty in nature has historically been a prevalent theme in art and books, filling large sections of libraries and bookstores. That nature has been depicted and celebrated by so much art, photography, poetry and other literature shows the strength with which many people associate nature and beauty. Reasons why this association exists, and what the association consists of, is studied by the branch of philosophy called aesthetics. Beyond certain basic characteristics that many philosophers agree about to explain what is seen as beautiful, the opinions are virtually endless. Nature and wildness have been important subjects in various epochs of world history. An early tradition of landscape art began in China during the Tang Dynasty (618-907). The tradition of representing nature as it is became one of the aims of Chinese painting and was a significant influence in Asian art. Although natural wonders are celebrated in the Psalms and the Book of Job, wilderness portrayals in art became more prevalent in the 1800s, especially in the works of the Romantic movement. British artists John Constable and JMW Turner turned their attention to capturing the beauty of the natural world in their paintings. Before that, paintings had been primarily of religious scenes or of human beings. William Wordsworth's poetry described the wonder of the natural world, which had formerly been viewed as a threatening place. 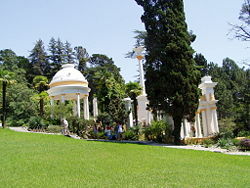 Increasingly the valuing of nature became an aspect of Western culture. This artistic movement also coincided with the Transcendentalist movement in the Western world. A common classical idea of beautiful art involves the word mimesis, the imitation of nature. Also in the realm of ideas about beauty in nature is that the perfect is implied through symmetry, equal division, and other perfect mathematical forms and notions. Landscape photograph of Tolima Colombia. Taiga forest in winter, Arkhangelsk Oblast, Russia. Atmospheric gases scatter blue wavelengths of visible light more than other wavelengths, giving the Earth’s visible edge a blue halo. Credit: NASA's Earth Observatory. A deserted island in Palau. Two Giant Sequoias, Sequoia National Park. Note the large fire scar at the base of the right-hand tree; fires do not kill the trees but do remove competing thin-barked species, and aid Giant Sequoia regeneration. 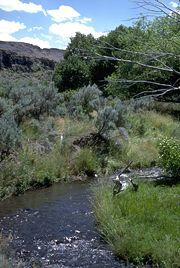 A Riparian zone along Trout Creek in the Trout Creek Mountains; part of the Burns Bureau of Land Management District in southeastern Oregon. ↑ An account of the pre-Socratic use of the concept of φύσις may be found in G. Naddaf, The Greek Concept of Nature (Albany, NY: State University of New York Press, 2005). ISBN 0791463737. The word φύσις, used in connection with a plant in Homer as discussed in the next reference, occurs very early in Greek philosophy and in diverse senses. Generally, these senses match rather well the current meanings in which the English word nature is used, as confirmed by W. K. C. Guthrie, Presocratic Tradition from Parmenides to Democritus (Volume 2 of his History of Greek Philosophy) (London: Cambridge University Press, 1965). ↑ The first known use of physis was by Homer in reference to the intrinsic qualities of a plant: ὣς ἄρα φωνήσας πόρε φάρμακον ἀργεϊφόντης ἐκ γαίης ἐρύσας, καί μοι φύσιν αὐτοῦ ἔδειξε. (So saying, Argeiphontes [=Hermes] gave me the herb, drawing it from the ground, and showed me its nature.) Odyssey 10.302-3 (ed. A. T. Murray). ↑ Isaac Newton's Philosophiae Naturalis Principia Mathematica (1687), for example, is translated "Mathematical Principles of Natural Philosophy," and reflects the then-current use of the words "natural philosophy," akin to "systematic study of nature." ↑ The etymology of the word "physical" shows its use as a synonym for "natural" in about the mid-15th century: D. Harper, "Physical," Online Etymology Dictionary (2010). Retrieved January 17, 2011. ↑ Wilkinson Microwave Anisotropy Probe (WMAP), "Content of the universe," National Aeronautics and Space Administration (2008). Retrieved January 18, 2011. ↑ B. N. Taylor, "Fundamental physical constants: Introduction to the constants for nonexperts," National Institute of Standards and Technology (1974). Retrieved January 18, 2011. ↑ D. A. Varshalovich, A. Y. Potekhin, and A. V. Ivanchik, "Testing cosmological variability of fundamental constants," AIP Conference Proceedings 506(2000): 503. Retrieved January 18, 2011. ↑ National Aeronautics and Space Administration (NASA), [http://www.grc.nasa.gov/WWW/K-12/Numbers/Math/Mathematical_Thinking/ideal_gases_under_constant.htm "Ideal gases under constant volume, constant pressure, constant temperature, & adiabatic conditions," NASA (n.d.). Retrieved January 18, 2011. ↑ J. D. Pelletier, "Natural variability of atmospheric temperatures and geomagnetic intensity over a wide range of time scales," Proceedings of the National Academy of Sciences 99(2002): 2546–2553. PMID 11875208. ↑ US Central Intelligence Agency (CIA), "Geographic overview," The World Fact Book (2011). Retrieved January 23, 2011. ↑ 11.0 11.1 P. H. Raven, G. B. Johnson, J. B. Losos, K. A. Mason, and S. R. Singer, Biology, 8th edition (Boston, MA: McGraw Hill, 2008). ISBN: 9780072965810. ↑ Athelstan F. Spilhaus, "Maps of the whole world ocean," Geographical Review Vol. 32(1942), issue 3:431-5. ↑ Encyclopaedia Britannica, "Lake," Encyclopaedia Britannica. Quote: "[a Lake is] any relatively large body of slowly moving or standing water that occupies an inland basin of appreciable size. Definitions that precisely distinguish lakes, ponds, swamps, and even rivers and other bodies of nonoceanic water are not well established. It may be said, however, that rivers and streams are relatively fast moving; marshes and swamps contain relatively large quantities of grasses, trees, or shrubs; and ponds are relatively small in comparison to lakes. Geologically defined, lakes are temporary bodies of water." Retrieved January 23, 2011. ↑ 14.0 14.1 U.S. Board on Geographic Names, Domestic names: Frequently asked questions (FAQs) #17 What is the difference between mountain, hill, and peak; lake and pond; or river and creek?," U.S. Geological Survey. Retrieved January 23, 2011. ↑ The figure "about one-half of one percent" takes into account the following. The total human biomass is the average weight multiplied by the current human population of approximately 6.5 billion. Assuming 60–70 kg to be the average human mass (approximately 130–150 lb on the average)(see, e.g., S. Leckie, "How meat-centered eating patterns affect food security and the environment," in M. Koc, R. MacRae, L. J. A. Mougeot, and J. Welsh, Hunger Proof Cities (Ottawa: 'International Development Research Centre, 1999). ISBN 0889368821. Retrieved January 23, 2011, which takes global average weight as 60 kg. ), an approximation of total global human mass is between 390 billion (390×109) and 455 billion kg (between 845 billion and 975 billion lb, or about 423 million–488 million short tons). The total biomass of all kinds on earth is estimated to be in excess of 6.8 x 1013 kg (75 billion short tons). By these calculations, the portion of total biomass accounted for by humans would be very roughly 0.6%. ↑ P. V. Sengbusch, "The flow of energy in ecosystems: Productivity, food chain, and trophic Level," (University of Hamburg Department of Biology, 2003). Retrieved January 23, 2011. ↑ 19.0 19.1 19.2 M. Pidwirny, "Introduction to the biosphere: Species diversity and biodiversity," in M. Pidwirny, Fundamentals of Physical Geography, 2nd Edition. Retrieved January 23, 2011. ↑ M. A. Withers, M. Palmer, et al., [Changing Patterns in the Number of Species in North American Floras "Changing patterns in the number of species in North American floras,"] Land Use History of North America (US Geological Survey, Biological Resources Division 2003). Retrieved January 23, 2011. ↑ D. E. Bunker, F. DeClerck, et al., "Species loss and aboveground carbon storage in a tropical forest," Science 310 (2005), iss. 5750: 1029–31. PMID 16239439. Retrieved January 23, 2011. ↑ B. A. Wilcox, [http://www.springerlink.com/content/810227460032m460 "Amphibian decline: More support for biocomplexity as a research paradigm," EcoHealth 3(2006), iss. 1: 1-2. Retrieved January 23, 2011. ↑ R. Clarke, R. Lamb, D. Roe Ward, eds., "Decline and loss of species," (UNEP, 2002). ISBN 9280720872. ↑ C. E. Adams, "The fish community of Loch Lomond, Scotland: Its history and rapidly changing status," Hydrobiologia 290(1994), iss. 1-3: 91–102. Retrieved January 25, 2011. ↑ E. P. Odum, Fundamentals of Ecology, 3rd edition (New York: Saunders, 1971). ↑ Wild Foundation, "What is a wilderness area?" Wild Foundation (2010). Retrieved January 25, 2011. ↑ D. B. Botkin, No Man's Garden: Thoreau and a New Vision for Civilization and Nature (Washington, D.C.: Island Press [for] Shearwater Books, 2001). ISBN 1559634650. ↑ H. Anderson, and B. Walter, [http://web.archive.org/web/20080123130745/http://vathena.arc.nasa.gov/curric/land/global/climchng.html History of Climate Change (NASA, 1997). Retrieved January 25, 2011. ↑ S. Weart, "The discovery of global warming" American Institute of Physics (2006). Retrieved January 25, 2011. ↑ L. Margulis and D. Sagan, What is Life? (New York: Simon & Schuster, 1995). ISBN 0684813262. ↑ G. B. Dalrymple, The Age of the Earth (Stanford, CA: Stanford University Press, 1991). ISBN 0804715696. ↑ A. Morbidelli, J. Chambers, et al., "Source regions and time scales for the delivery of water to Earth," Meteoritics & Planetary Science 35(2000), iss. 6: 1309–1320. Retrieved January 25, 2011. ↑ J. B. Murphy and R. D. Nance, "How do supercontinents assemble?" American Scientist 92(2004), iss. 4: 324. Retrieved January 25, 2011. ↑ J. L. Kirschvink, "Late Proterozoic low-latitude global glaciation: The Snowball Earth," in J.W. Schopf and C. Klein, eds., The Proterozoic Biosphere (Cambridge: Cambridge University Press, 1992) ISBN 0521366151. ↑ D. M. Raup and J. J. Sepkoski, "Mass extinctions in the marine fossil record," Science 215(1982), iss. 4539: 1501–3. PMID 17788674. ↑ 36.0 36.1 L. Margulis and D. Sagan, What is Life? (New York: Simon & Schuster, 1995). ISBN 0684813262. ↑ J. Diamond, N. P. Ashmole, and P. E. Purves, "The present, past and future of human-caused extinctions," Philos Trans R Soc Lond B Biol Sci 325(1989): 469–76. PMID 2574887. ↑ M. Novacek, and E. Cleland, "The current biodiversity extinction event: Scenarios for mitigation and recovery," Proc Natl Acad Sci USA 98(2001), iss. 10: 1029. PMID 11344295. ↑ J. Bibring, Y. Langevin, J. Mustard, F. Poulet, R. Arvidson, A. Gendrin, B. Gondet, N. Mangold, P. Pinet, et al., "Global mineralogical and aqueous mars history derived from OMEGA/Mars Express data," Science 312(2006), iss. 5772: 400–4. PMID 16627738. ↑ S. Turner, [http://www2.jpl.nasa.gov/galileo/news8.html "Detailed images from Europa point to slush below surface," Brown University News Bureau (1998). Retrieved January 26, 2011. ↑ E. Mayr, What Evolution Is (New York: Basic Books, 2001). ISBN 0465044263. ↑ K. J. Oosthoek, [http://www.eh-resources.org/philosophy.html "Environmental history: Between science & philosophy," Environmental History Resources (1999). ↑ C. P. E. Burns, "Altruism in nature as manifestation of divine energia," Zygon 41(2006): 125-137. This page was last modified on 26 September 2016, at 21:45.